Flat Front. 1 Open & 1 Button Through Back Pockets. Button Closure. 2% Spandex. Great Looking Old Navy Pants. 100% Cotton. I will resolve any issues should any occur. Zip & Button Closure. Athletic Apparel. Baby & Toddler Clothing. Baby Accessories. Dress Shirts. Style : Dress - Flat Front. Inseam : 34. (See Photos). Color : Black. Always Cool and Authentic Style from Old Navy. In good condition. Material: 100% Cotton. Color: Black. Size Type: Regular. 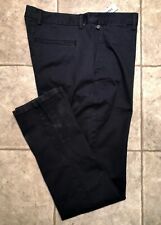 Old Navy mens navy blue flat front slacks. Built in flex for stretch, movement and comfort. 5 pocket. Slim fit. Straight leg. Mens size 36x34 Brand new with tags. Feel free to ask questions. I am happy to combine shipping with my other items. Non smoking non pet home. Gentle wear. Good condition. see photos. Size: 36x30. Color: Charcoal Gray. Material: 65% Wool, 25% Nylon, 10% Polyester. Style: Dress Pants - heavier weight. Manufacturer: Old Navy. Flat Front. Loop Over Button Back Pockets. Button Closure. 100% Cotton. Zipper Fly w/ Hook & Button Closure. Size: 36X32. See Photos, Item Is New And Unworn, Unused. Design/ Style: Regular Fit Super Khakis. Relaxed-fit pant in washed twill featuring cargo pockets and flap pockets at back. 6 pockets/ the cargo and rear pockets are button closures. These pants are in great shape and they feature Machine Wash.
We're living in a golden age of pants. Not only did grandpa have to walk five miles in the snow to get to school, he also toiled in uncomfortable, ill-fitting trousers that required a lot of ironing just to look presentable. Sits at waist. Our roomiest fit. Relaxed through hip and thigh. Straight leg. Button-closure and zip fly. Flat front. Diagonal on-seam pockets and exterior welt-coin pocket in front; welt pockets in back. Soft, durable cotton twill is specially stone-washed with extra softener for a broken-in look and feel. Button-front and zip fly. Flat front. Slant pockets and welt-coin pocket in front; welt pockets in back, with button closure at left pocket. Brushed, soft-washed cotton twill. Built-In Flex Max is engineered with double the innovative stretch technology for maximum comfort and movement. Tag-free fit label inside back waist for added comfort. #376556-02-1 Machine wash. Hang loose, even in your wear-to-work khakis. Slant pockets and welt-coin pocket in front, welt pockets (with buttoned closure at left pocket) in back. Machine wash cold, tumble dry low. Button-closure and zip fly. Slant pockets in front; welt pockets in back. Button closure; zip fly. Straight through hip and thigh. Straight leg. Machine wash. Non-iron cotton is specially treated to remain wrinkle free. Active non-iron technology by tossing in the dryer. 100% Cotton. Pleated Front. Button Through Back Pockets. Button Closure. See photos. They are not brown like it seems in photos. They are very dark green. Thigh- 12". 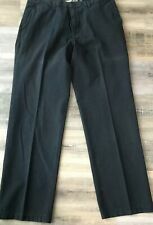 Old Navy Khaki Pants Men Straight 36x34. Condition is New with tags. (Unopened) Shipped with USPS Priority Mail. Color: Olive green, neutral. Style: Flat front, twill, dress pants. Size: 36 x 32. Inseam: 32". Waist (laying flat): 19". Your classic khaki just got an upgrade. Ultimate Khakis have a sleeker silhouette with just enough stretch so you can wear them whenever, wherever. Machine wash cold, tumble dry low. Flexin' on 'em. We will be more than happy to quickly assist you. Opening of pant leg, laid flat and across:9. Excellent condition! Would make a great gift. Old Navy Workers Jeans - Sturdy Cotton Twill - Khaki Tan. The style is flat-front worker's pants with distressing on edges, including hems. Old Navy Khaki Pants! Size 36 X 34 Broken in Straight Fit Khaki Pants! Old Navy! Size 36 X 34 Broken in Straight Fit Khaki Pants! The pants are in very good condition with no marks or stains. Machine wash cold, tumble dry low. Slim through hip and thigh. Rise is 11.5". Leg opening is 7.5". Button closure and zip fly. Lightweight, breathable Dry Quick fabric that dries. Waist: 19. Length: 40.5. Inseam: 30.